Bank Nifty opened higher at 24307 and declined sharply just after opening to register day’s low 24234 but bounce back again by more than 200 points to register new all time high 24460 and finally closed 163 points up at 24420. 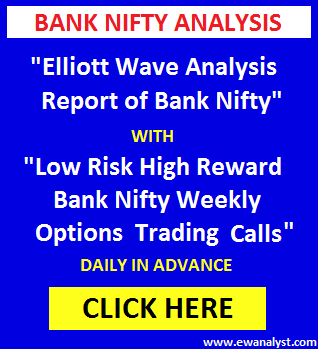 Yesterday, bounce towards 24564-24871 was expected and I suggested buying Bank Nifty 27 July 24200 call in 24257-24200 range with stoploss 24191 expecting minimum target 24323-24401 which further can extend towards 24564-24871. 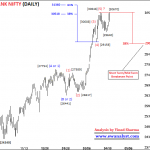 Bank Nifty bounced from 24234-24460 today and Bank Nifty 27 July 24200 call bounce from 143-254 and finally closed at 226. 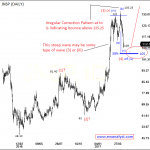 Now, we need to analyze latest charts for further outlook. Minimum 38%-61% projection for wave (5) is placed at 24564-24871 which is the expected targets range for completion of wave (5). 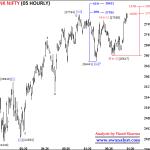 Now, we need to analyze progress of wave (5) started from 24066 on separate 5 min chart to predict next move. 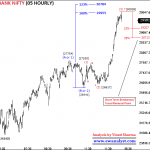 This is 5 min time bar chart of Bank Nifty covering move from 24066 which is the start of wave (5) on previous chart. 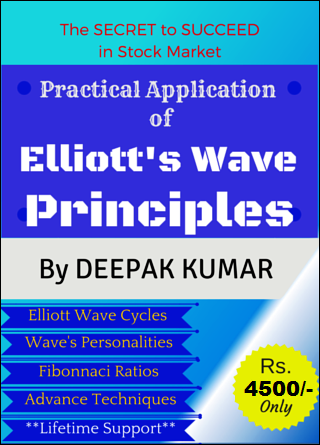 Minimum 38%-61% projection for wave (v) is placed at 24475-24556 which is the expected target range for completion of wave (v). 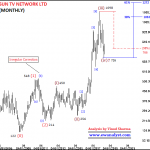 Within wave (v), it seems wave 1 may be completed at 24449 and wave 2 may be completed at 24382 as an irregular correction or still in progress. 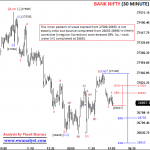 24382 [end of wave 2 of (v) of (5)] can be referred as breakeven point and same can be used as stoploss for longs. 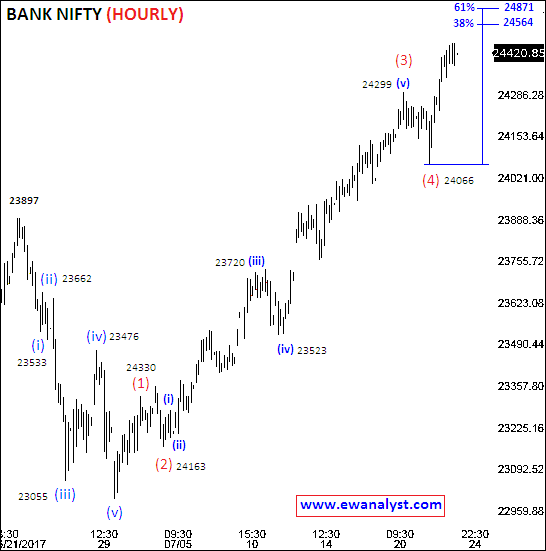 Bank Nifty register new all time high 24460 after breaking earlier high 24299 and it still has possibility bounce further towards 24564-24871 for completion of wave (5). 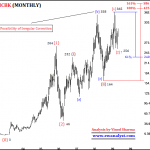 38% retracement of wave (iii) 24305 is the point below which we can think of any reversal. 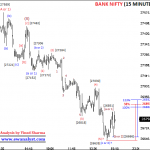 24382, end of wave 2 of (v) can be used as fresh stoploss for any longs. 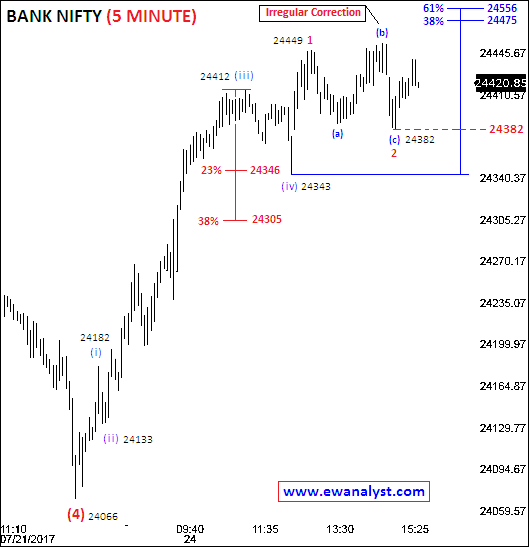 Bank Nifty 27 July 24200 call bought in 24257-24200 range can be hold with stoploss of 24382 [end of wave 2 of (v)] expecting minimum target 24564 which further can extend towards 24871. Bank Nifty 27 July 24300 call can be bought again if Bank Nifty decline towards 24382-24343 range with stoploss of 24299 expecting minimum target above 24460.